Here is my personal account and experience from Typhoon Ondoy. Unfortunately, we've been hardly hit and affected by the recent Typhoon Ondoy last Sept 26. (Day 1) where flood waters reached to an all-time high of almost 5 feet inside our house. 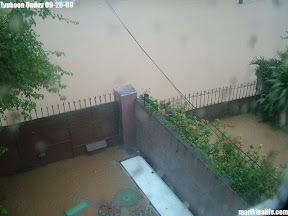 This is the worst and deepest we've ever experienced here in our house in SSS Village, Marikina City. We're used to floods and most of them only reach the street in front of us or rarely, up to 1 foot inside the house. Nothing can prepare you for a flash flood that rises at an alarming rate. We were caught offguard with the waters as it has never flooded this fast ever. In a span of less than 4 hours, the waters rose from street level to chest deep inside the house. Cars parked along the streets were submerged till the top of their windshields. Car alarms set off one by one including our two cars inside our garage and driveway. Believe me that trying to remove a car battery while submerged in water and being all wet while dealing with something delicate as a wet car battery possibly exposing ourselves to ground and shock while panicking is such a stressful and scary experience. Typhoon Ondoy's rainfall in a short span of time was measured to be more than what an average month worth of rainfall was. On top of this all, Marikina is also affected by the overflowing and releasing of water from 2 dams which pass through the Marikina River. The river overflowed and so instead of our street waters being channeled towards the river, the waters from the river were spilling outwards to all areas. Our electricity and phone lines were all cut. My celphone was low on battery charge and the only communication we had was listening to the radio. We tried to move whatever we could to higher ground but there simply wasn't much time to do everything. 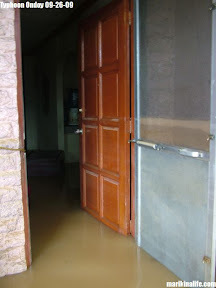 A lot of our stuff was submerged in water and even huge and big appliances and furniture like our refrigerator, sofa, tables and chairs were all floating. The 1st floor became an obstacle course with an advanced level of difficulty. Imagine trying to carry a TV on top of your head cause waters were chest deep, walking through the flood and avoiding huge moving objects like a huge cabinet floating in an unpredictable direction. Thank God we had a 2nd floor but it was quickly filling up with stuff that we needed to make way to go up and down the stairs in case of any emergency. Even our 3 dogs were panicking cause the places where we let them stay put were beginning to float too. We moved them to a huge floating table and would just hope that they would stay put so the table wouldn't capsize. It came to a point where we had to just stop rescuing our stuff and just think about our safety. In the last hour of what seemed like an neverending rising of flood, we managed to salvage any food and bring it upstairs. We got a loaf of bread, some canned goods, paper plates and plastic spoons and forks, and some bottles of mineral water. We couldn't open the ref cause it was already floating and all the foods inside were already submerged in muddy flood water too. I was scared that the china cabinet that fell on to the water had broken glass. It's a good thing the water broke the fall and the impact wasn't enough for the plates and glassware to break. By mid afternoon, the rains stopped and all we could do was look out the window to see the extent of flooding the typhoon has left. Flood was everywhere. We couldn't find a single piece of ground not left submerged outside. Come evening, everything was dark and quiet. With no lights and no people in the streets, our area was rendered as a ghost town. No lights, no sound and just the calmness of the flood waters still evident everywhere. This is the time we were already listening to the radio and found out that a lot of our fellow city residents weren't as lucky as we were. The hardest hit was Provident Village, some, 4 kilometers away from us with the Marikina River in between our village's location. The residents there had to climb their rooftops as the waters totally submerged all ground floors of the houses. We also heard that several villages along the riverbanks have been severely affected. Being a resident of Marikina, I wanted to contact all my friends and relatives to find out if they're ok. But not having any means of contacting them rendered us a desolate island. Concerned friends and relatives were also trying to get hold of us but couldn't. We were just lucky that the rains had stopped and the waters were subsiding little by little. 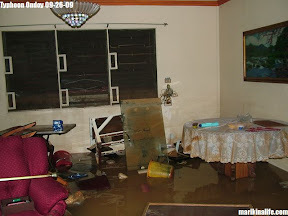 The next morning (Day 2), the flood waters inside the house were gone. The street still had some flood but only up to the legs. We then saw the aftermath of the typhoon. Everything was drenched and covered with mud. The TV, refrigerator, washer & dryer, cabinets, tables, sofas, clothes several belongings were mostly damaged. Our humungous ref was lying down on the floor as the waters gently laid down the floating ref. Our china cabinet broke in half. Most of the wooden and cardboard cabinets weakened. Utensils and plates were all muddy. The cars' interior were all damp and grounded. Unsaved food was scattered all around the house. We were hoping that floods wouldn't resurface but we had to start the long process of cleaning for sanitation purposes. We were scared for all kinds of sicknesses. We didn't take any chances with any food that was flooded, even sealed bottles or canned goods, for fear of contamination. We had to bail out any water left inside the house to lower any possible infection from the stagnant waters. And we had to remove all the mud left inside. Not having any electricity yet made it harder to clean up. It's a good thing my tita and cousins who lived in Marikina Heights weren't severely affected and dropped by to check up on us. They brought us food and drinks, which we really needed. I asked them to charge my celphone so I could keep the lines of communication open. We were cleaning the house the rest of the day and threw anything we couldn't recover anymore. The entire day was tiring and by night time, we were all exhausted with overfatigue from cleaning. By Monday (day 3), we needed to buy food as our supply was nearly depleted. 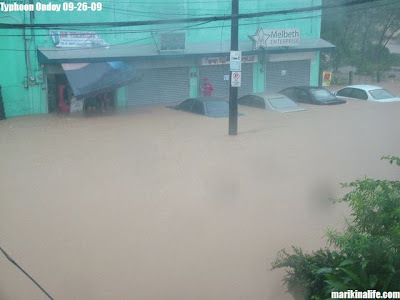 The aftereffect of the typhoon made it so difficult to buy goods from the grocery or food from the fastfood/restaurants cause most of them within the vicinity have been hit by the floods too and were closed. Those that were open, were filled with people frantically panic buying everything and the shelves were empty in hours. My college friends Rai and Eya were checking up on me since I was nowhere online as I usually am and suspected that we may need help. They asked for directions and the next day they dropped by with lots of food, toiletries and items that would make our recovery easier to manage. It's been a week since then and we're still not through cleaning up and recovering. With Typhoon Ondoy and Pepeng both out of the country, it's back to normal for most people. For us, it's still a long way from over and going back to our regular lives. We're getting there though, little by little. But bottomline is that we're all okey. I just want to thank everybody for your concern and help. For those who texted, e-mailed, left messages online and tried to contact me, thank you. I may have not been able to thank everyone personally which is why I am sending this message to you all. All the material things can be replaced... but we only have one life to live. And I thank God I am alive. Take care everybody. 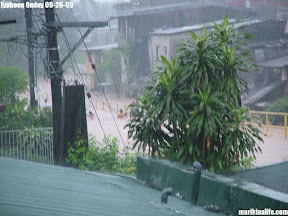 You can check out my Marikina Blog at http://www.marikinalife.com for more on the Typhoon aftermath in Marikina City.